Never used in new condition. other than the box. MID/BASS FREQUENCY DRIVER 165-mm (6-1/2 in) mineral-filled polypropylene cone. MAXIMUM INPUT POWER 80 watts. SUITABLE AMPLIFIER POWER RANGE 15 - 100 watts. Pair Paradigm Studio 40 V2 Speakers. Condition is Used. Shipped with FedEx Ground or FedEx Home Delivery. Manufacturer: Paradigm. With Integrated Back Box. Item Condition: Open box. Bin Location:WK05A. Color: Black With White Grille. Pickup Location 431 N Wright Brothers Drive. Pair of Paradigm Atom v2 Speakers. Includes wall mounting brackets. 11 x 8 x 6. 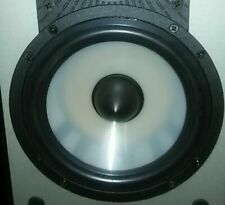 In the example photo these woofers are the ones just to the inside of the black, dedicated bass woofers. Condition is Used. Phantom v2 Specifications. Sensitivity Room / Anechoic. Suitable Amplifier Power Range. Black Ash, Light Cherry, Dark Cherry. Mid/Bass Frequency Driver. Maximum Input Power. 15 - 160 watts. Both speakers working and sound amazing. All connections are original in the back and all working great. Missing a box, manual and stands. This is a great speakers to own if you want amazing sound. Condition is Used. They sound great,I was impressed. The bass out of these speakers is impressive,can’t imagine you needing a subwoofer but you certainly could if you wanted to. But you probably know this if you are looking for these speakers. The woofers and tweeters have all been inspected and given a clean bill of health and sound amazing. These speakers sound amazing and are built very well! Paradigm CC-690 Center Channel Speaker - Espresso. Original owner, performs flawlessly, small blemishes, condition 8/10. Prefer local pickup but open to meeting within agreeable distance from 34997. Excellent Pre-owned condition! Performs as it should. Excellent Condition! 300 Watts of pure power! 100% functional speakers, very good condition cosmetically. I changed my set-up and no longer have a use for these. Included are some quality Omnimount speaker brackets which allow mounting to wall or ceiling. Paradigm Seismic 12a Subwoofer. Condition is Used. Shipped with UPS Ground. Paradigm Studio CC V.2 Reference Series Center Speaker (Black). This speaker great with no major marks on the casing. Zero issues to the sound. Excellent Condition/ Sounds Amazing. FINISHES Storm Black Satin. LOW FREQUENCY EXTENSION 30 Hz (DIN). WEIGHT 10.5 lbs. AMPLIFIER FEATURES Bi-amplified 2 x 50 watts RMS, 100 Watts Dynamic Peak Power. The Paradigm Titan compact "bookshelf" speaker has been in manufacture for several years, and this pair is the late model v.4 version. Just normal wear and tear- speaker cabinets in good condition. There is a buy it now price that is a great value for these speakers. Trade: Make your budget go further with a generous trade-in allowance. Let us know what you have available, and we’ll get you the best possible trade-in allowance. Your online source for the best value in new and used audio gear. Condition is Used. Slight discoloration due to them being white- but works like they should. Clearing out the warehouse and everything must go! Long-Travel Motor/Magnet Structures: Despite fewer drivers than in previous series’, floorstanding and center channel speakers actually plumb deeper. Since its inception, the Monitor Series has been a favorite of audiophiles on a budget — with Series 7, that hasn’t changed. Condition is Used. STANDS NOT INCLUDED. Pics updated to show the condition of the speaker. Crossover: second-order electro-acoustic at 2.0kHz. Frequency response: 54Hz–22kHz, ±2dB (on axis), 54Hz–20kHz, ±2dB (30° off axis). Dented/chipped corner, scratches on top, three marks on lower right side. Paradigm’s Premium Wireless Series is the only wireless streaming system to feature reference-level performance. Finally, you can experience the freedom of wireless audio streaming with bold, dynamic performance. 5 1/2" polypropylene woofer. cutout is 9.1875" x 6". 10.5" high x 7.375" wide. Paradigm CC-170 v.3 center speaker - very clean, and in excellent working condition. Single speaker only in excellent tested condition . These speakers are in good used condition- general wear is to be expected. Paradigm AMS150 v3 In-ceiling Speakers (Pair) - Includes the two speakers shown. Tested and working. There are scuffs/scratches on the grills and beauty rings. Paradigm CS-80R v.3. Specs per Paradigm web site Box was opened to inspect when I received them myself. Speakers were never installed. SENSITIVITY ROOM / ANECHOIC 90 dB / 86 dB. SUITABLE AMPLIFIER POWER RANGE 15 - 90 watts. 1-Paradigm CS-150 In wall speaker Excellent Condition. Never used. Paradigm Atom v2 Bookshelf Speakers - these are NEW.you can not find a new pair of these for sale anywhere so for those who want another pair, this is it. Outstanding speakers for theirs size/price. 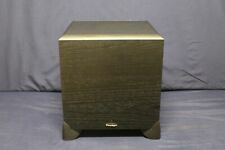 Paradigm PDR-8 series subwoofer with power chord, used but still works. This speaker is in good used condition- general wear is to be expected. Paradigm Bundle: Shift A2 Powered Bookshelf Speakers (Storm Black Satin - Pair) and BD1 Bluetooth Receiver. BD1 Bluetooth Receiver. BD1: Stream music from your Bluetooth-enabled device to the A2 powered speaker. The speakers are the last part of the signal chain in any stereo system, making them very important. Paradigm makes a variety of high-quality stereo speakers with a great look, helping them fit into any home. 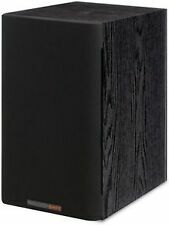 For more information, check out the following information about Paradigm speakers being sold on eBay. What kinds of speakers does Paradigm make? Sub - This speaker is responsible for the subsonic frequencies. It can either be purchased as a standalone speaker or as part of a larger speaker tower. Woofer - The woofer projects the mid-range frequencies, the range where most of the music occurs. Tweeter - The extreme high-end frequencies come through this speaker. High-quality tweeters are essential for sonic clarity. Center - In a surround system, these speakers sit in the center of the signal as the focal point of the sound. Bookshelf - These are smaller speakers in the Paradigm line meant to fit on shelves and blend into a room, not interrupting the aesthetic. Do these speakers have built-in crossovers? Yes. The speaker towers with tweeters, woofers, and subs all have built-in adjustable crossovers. Use this device to determine which part of the signal goes to what speaker. This functionality is essential for getting a clear sound and preventing speakers from blowing. It is mostly designed to ensure the subsonic frequencies don't bleed into the mid-range, which causes the signal to be muddy and over-driven. Does Paradigm make speakers for home theaters? Yes. Some models Paradigm manufactures are specifically designed to transmit home theater sound in the form of surround sound. This includes models like the Paradigm Cinema ADP line. Center speakers are also usually used in home theater systems. Shoppers looking for speakers for their home theater system don't have to use cinema speakers, but it will improve the quality of the surround sound in whatever room they are used. Do they come in different looks? Yes. Paradigm understands that, for some shoppers, the look of the speaker is just as important as the sound. The company offers most of its Paradigm speakers in a few different finishes including black, black ash, cherry, and gloss. The tower speakers come in the biggest variety of finishes. Content provided for informational purposes only. eBay is not affiliated with or endorsed by Paradigm.